The QS-7 OPD Galvanometer combines strong performance with cost-effective value. 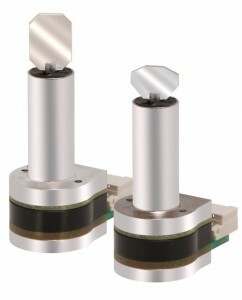 Our moving-magnet mechanical design incorporates our exclusive ceramic ball-bearing motors that are combined with our high output position detectors. Patented low inertia optical detectors achieve dynamic performance with faster, more accurate positioning. When integrated with Nutfield’s QD-4000 Servo Amplifier, the QS-7 OPD scanners deliver excellent speed and accuracy. Nutfield Tech’s mechanical design uses low resistance/low induction coils for increased scanning speed and optimized thermal characteristics. Our OPD generates 4 times the output signal for high signal/noise ratio and outstanding accuracy. * For larger angles, contact Nutfield Tech. All specifications are using Nutfield Tech's QD-4000 Servo Amplifier @ ambient condition. Specifications subject to change without notice.